Seafood lovers are invited to eat, drink and make a splash for the new Prineville Splash Park during a Seafood Boil at Club Pioneer. "It's an opportunity for people to come, enjoy seafood and help raise money for the splash park," said Club Pioneer owner Jim Roths, who has jumped in to support the Kiwanis' project. The all-you-can-eat Seafood Boil fundraiser is set for 6 to 9 p.m. Saturday, Aug. 18 at Club Pioneer. "It's going to be a seafood boil that's going to have crab, shellfish, a variety of seafood, sausage, potatoes, corn," Roths said. "It's all-you-can-eat seafood." Tickets are $40 – $10 of which will be donated directly to Kiwanis. Club Pioneer will also donate 10 percent of all beverage sales in the bar/patio. Advance tickets are available in the bar, and additional tickets may be available at the door. "We'll just be limited by the size of the restaurant," Roths said, adding that it would be helpful for people to purchase tickets in advance. Tickets will also be sold for a raffle drawing, with all ticket sales donated to Kiwanis. Kiwanis Club of Prineville member Wayne Looney, who has headed up the splash park project, said Roths approached the club of his own volition six to eight months ago. "He wanted to be a part of the project because he saw such value in it for the community," Looney said. "So, I said, 'Well, thank you very much. We would really appreciate your support.'" The Seafood Boil is just one of several summer-time fundraising efforts Roths is leading at both Club Pioneer and Dillon's Grill. "He's handed over a meaningful amount of money already that will be well appreciated and probably needed, the way that the scope of this thing is getting," Looney said. Kiwanians were initially hoping that the splash park would be open by now, but they realize that will not happen. "I believe that we'll have a completion date in spring sometime next year so that we will be able to have a full splash park season for our youth next year," Looney said. "We have so much in-kind support, and so many of those supporters are so busy right now." Construction for the splash park started earlier this summer at the corner of Northeast Fourth and Northeast Court streets. It will feature a 40-foot circle with multiple water spouts, shading, a bathroom, terracing and lighting. 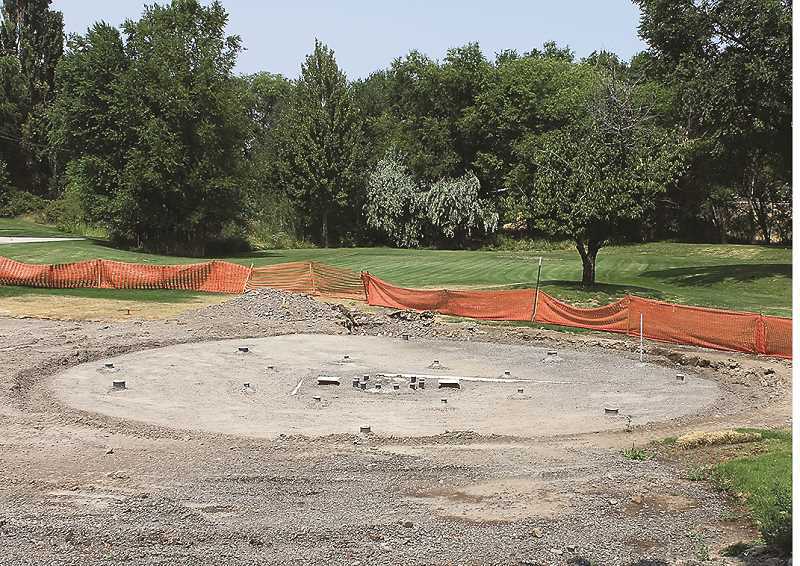 "Anderson Pool Works has come over and done the rough plumbing, so you can clearly identify where the splash pad itself — the 40-foot circle — will be, and there are stubbed up pipes out of the ground where the individual features will be eventually hooked on there," Looney said. Joe Floyd and Sons, one of the in-kind supporters, will soon begin building the bathroom, sidewalks and splash pad surface. Pumps, lighting, shade structures and terracing will follow. Looney estimates the project will cost $280,000, which includes $150,000 to Anderson Pool Works and $80,000 for the bathroom. Once the project is completed, Kiwanis will hand it over to the Crook County Parks and Recreation District. "Parks and Rec will inherit this," Looney said. "When we have the dedication, Parks and Rec will then be the authority that manages and operates the pad." "This is a community-driven project, and Jim is another one of the people in our community that sees value in this project and is progressive in nature and knows this will be an asset for our community's growth going forward and for the youth of our community," he said. Place: Club Pioneer, 1851 NE Third St.